FAIRFIELD, N.J. — April 3, 2019 — Middle Atlantic Products, a brand of Legrand | AV, today announced the company’s C3 Series Credenza — previewed at CEDIA 2018 and ISE 2019 — is now shipping. This award-winning solution combines a 10-inch-deep space-saving profile with modern design that meets the compliance standards of the Americans with Disabilities Act (ADA). The true innovation, using Middle Atlantic’s unique Frame to Furniture™ design approach, is a flexible, configurable rack frame that allows integrators field-mounting flexibility for traditional rackmounts and small devices. This provides them with a solid foundation that can scale as AV components need to be added or replaced without sacrificing the system reliability. 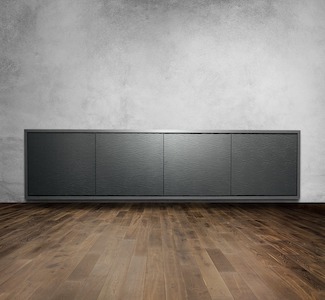 Within a 10-inch-deep footprint, the new C3 Series Credenza features a frame that allows for a modular systems approach to equipment mounting, providing integrators the flexibility they need to install a wide variety of localized AV equipment, including the increasing number of small AV devices for residential and commercial applications. The frame contains vertical notches in each bay, offering the integrator the benefit of nearly endless storage and rackmount configurations. Static or slide-out rackmount Tech Kits include a thermostatically controlled fan, which mounts seamlessly in the base of the unit, and a seven-outlet, surge-protected power strip. Utilizing the company’s patented Lever Lock™ tool-free mounting system, small-device mounting and cable management has never been easier. These features let integrators make final configuration decisions in the field confidently, knowing that the C3 can scale and grow as the system expands. As with other signature Frame to Furniture solutions, the C3 Series Credenza offers design flexibility to meet clients’ aesthetic needs. Customers can choose among a selection of styles and finishes that draws on the most popular design trends for a completely customized furniture solution — including new sleek metallic finishes. The wood kit is installed separately from the frame, protecting it during installation while providing integrators the access and visibility they need. Readers may explore this award-winning solution’s key features and watch an installation unfold at https://www.middleatlantic.com/c3.aspx. More information about Middle Atlantic Products’ unique furniture design approach is available at https://www.middleatlantic.com/frame-to-furniture.aspx.